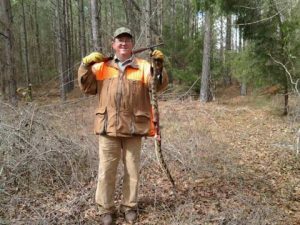 A nearly five foot rattle snake was killed Feb. 10 in Elko, SC, after almost being stepped on by Edgefield County resident Jasper Agner. Agner was in Elko rabbit hunting with friends when he had his close encounter with this reptile. As he relayed, due to vision and hearing issues, he could not clearly see the snake nor hear its rattles as he was walking along. Agner said his foot was about twelve inches from the snake when what he thought was a hole in the ground began to rise. Realizing at that moment that what looked to his impaired eyes as a hole was actually a snake, Agner jumped out of the striking distance. A hunting companion, who recognized the “snake step” Agner had taken, ran over to confirm the snake was a rattle snake. Before any more observations could be made, however, the snake’s time on earth was brought to a speedy end. Relaying to his doctor the close encounter with the rattle snake, Agner asked his doctor if he had been bitten, could the doctor have saved him. The doctor replied, “Yeah, but it would not have been pretty.” Dr. Gibbons said this is true as fatal snake bites in the United States are “very rare,” but treatment for snake bites can be painful. Dr. Gibbons said most snake bites that do occur are to the hands and arms from people trying to pick the snakes up. Dr. Gibbons said the important thing to remember is that the snake is not going to chase you — a point some would argue. He said that if you just leave the snake alone, the snake will you leave alone, too. However, that might be easier said than done for some folks as snakes are not looked upon too kindly by many. In fact, I have heard it said many times, “ the only good snake is a dead snake.” That debate, however, will have to wait for another day.